cloud softlight mobile is a soft, luminous pendant light that is lit internally by LED. cloud softlight mobile is designed to suspend from a single point to perfectly balance three luminous clouds. Inspired by the wondrous mobile constructions of Alexander Calder, the mobile structure creates a broad canopy of cloud forms, providing light, acoustic absorption, and a sense of intimate enclosure. Sculptural three-dimensional cloud-like forms are mysteriously radiant when viewed from any direction, as they move gently in the air currents overhead. Mobiles in three different sizes can be suspended independently or hung in combination (with other mobiles and/or cloud softlight pendants) to create vast, gently glowing cloudscapes that flows in a unique, custom topography. cloud softlight mobiles are made from a paper-like, non-woven polyethylene. The polyethylene textile cloud shades are tear, UV, and water resistant; fire and acoustic rated; and 100% recyclable. cloud softlight mobiles are available in three sizes - small mobiles (1700mm (5.5’) total diameter), medium (2100mm (7’) total diameter), and large mobiles (3000mm (10’) total diameter). The cloud shades are illuminated by energy-efficient LED, with the option of neutral ‘daylight white’ (4800K) or ‘warm white’ (3300K). The intimate spaces created under cloud softlight are further added to experiences of viewing cloud from above or from right in its midst. 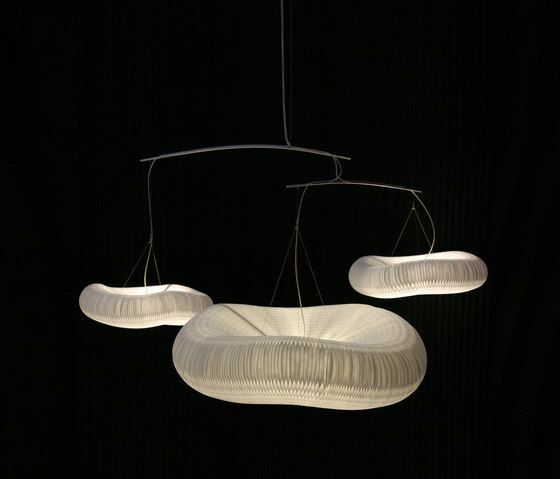 cloud softlight mobiles and pendants are made from the same translucent white textile material as complimentary cloud floor + table softlight, urchin softlight, and textile softwall + softblock, which can be used with one another to create fluid, sculptural environments. softlighting belongs to molo’s innovative and award winning soft collection of expandable/compressible furniture, lighting, and space partitions created from flexible paper and textile honeycomb structures.